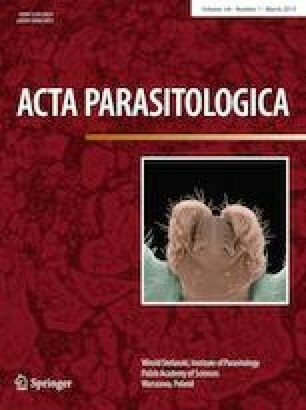 Pomacea lineata acts as the natural biological controller of Biomphalaria glabrata, the intermediate host of Schistosoma mansoni, as they are found in the same environment. However, there are no studies reporting an infection in P. lineata due to S. mansoni. Thus, this work investigated parameters related to the immunity of P. lineata after exposure for 24 and 48 h to S. mansoni under experimental conditions. The F1 generation of these snails was used in this study. The total and differential counts of hemocytes, phenoloxidase, nitric oxide, total proteins, expression of TNF-α in hemocytes and histopathology of the head-foot organ were analyzed. Exposure to S. mansoni promoted an increase in the total number of hemocytes, an increase of granulocytes, a reduction of agranulocytes and hyalinocytes, an increase in phenoloxidase levels, total proteins and nitric oxide. There was TNF-α expression in the agranulocytes and granulocytes, increasing in intensity after exposure to the trematode. Head-foot histopathology revealed the presence of sporocytes in the fibromuscular layer surrounded by granulation tissue only within 24 h. At 48 h, there was marked fibrosis in this layer and little granulation tissue. Thus, we can conclude that P. lineata seems to trigger a series of immunological strategies in a very effective way that confers some resistance to S. mansoni. To the Coordination of Improvement of Higher Education Personnel (CAPES) for the granting of the PhD scholarship, to the Aggeu Magalhães Research Center—Keiso Asami Immunopathology Laboratory of UFPE and to the Laboratories of Histology and Ecophysiology and Animal Behavior of UFRPE for having open its doors to the realization of this study.